How Did the Stars Get Their Points? Those are hot young stars in the Large Magellanic Cloud—one of the puppy-dog galaxies that follow the Milky Way around—photographed by the Hubble Space Telescope. (Detail cropped from a Wikipedia image.) Note that four rays seem to emanate from each of the brightest stars. The rays are not, of course, true beams of light radiating in the four cardinal directions. They are an artifact of the telescope’s structure: a diffraction pattern created by the four vanes of the “spider” that supports the secondary mirror within the barrel of the telescope. Many other telescopes have three-vane spiders that yield a six-pointed diffraction pattern. Recently, in my lovable know-it-all manner, I was holding forth on the idea that this diffraction effect—a mere accident of instrumental design—might actually be the source of the familiar iconographic star, with its five or six angular points. In other words, we think of a star as something spiky, poking out in various directions, because we’re used to seeing telescopic images with this diffractive defect. 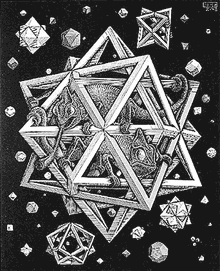 At right is M. C. Escher’s interpretation of what stellar means. For other examples see the Hollywood Walk of Fame or the flags of the U.S. and the E.U. and those of more than 50 other countries, not to mention Texas. Well, it turns out my cute idea about the cultural influence of telescopic photos is utterly bogus. If you need any evidence, the engraving reproduced below should suffice. It shows the muse Astronomia (a.k.a. Urania) pointing out the moon and stars to Ptolemy. 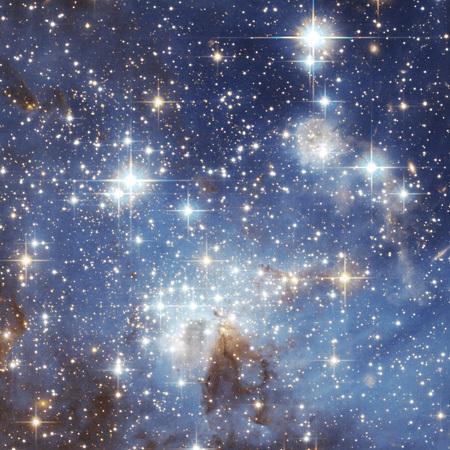 The stars are five- or six-pointed scribbles that beg to be called asterisks. 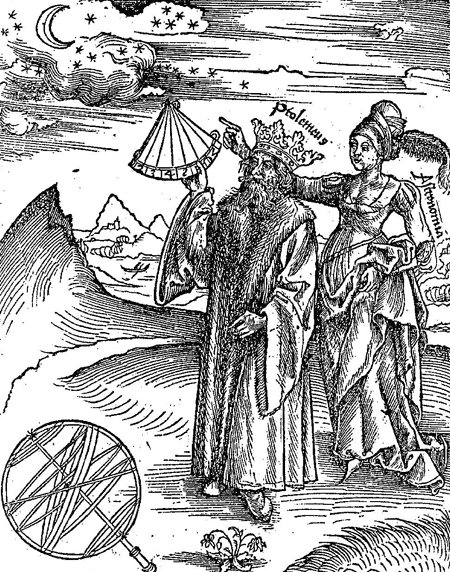 The engraving appears in the Margarita Philosophica of Gregor Reisch, published in 1504, which is a full century before Galileo turned his telescope to the heavens. Whatever those engraved stars are, they are not artifacts of telescope spider vanes. The dictionary offers further evidence. For example, the starfish (genus Asterias, class Asteroidea) has had that name at least since 1538. And the asterisk—the typographical mark—has a citation in the OED going all the way back to 1382. These terms make sense only if the concept of a star was already associated in most people’s minds with a spiky polygon, rather than a dimensionless point of light in the night sky. And that’s what puzzles me, because the stars really do appear to be dimensionless points of light. When I stare at the sky, I see some twinkling going on, but nowhere do I see pentagrams and hexagrams pinned to black velvet, or even the slightest hint of angularity. So where did this tradition get started? Did the Greek word ?????? already convey a sense of symmetrical spikiness, so that ancient Athenians would have understood why we call certain flowers asters? Is the same iconography prevalent in other cultures, say in China? Those 50+ star-studded flags (including China’s) suggest that the conventional stellar icon is at least recognized globally, but they don’t tell us where and when it all began. After my telescopic theory fell apart, I had a second hypothesis, namely that the star icon might come from the symbol-happy world of astrology, but I’ve found no support for this idea either. So I throw the question out to the starry void: How did the star get its points? Addendum 2011-12-16: The illuminating comments below on ancient Egyptian paintings of stars would appear to settle part of my question: Well over 2,000 years ago, at least some people were already drawing stars in much the same way a modern kindergartner does. What I’d still like to know is why. Yes, there are many plausible just-so stories, but you’d think that someone at the time might have offered a word of explanation. The other day I spent a pleasant afternoon leafing through The History and Practice of Ancient Astronomy, by James Evans (New York: Oxford University Press, 1998). It’s quite a thorough introduction to Greek and Egyptian ideas about the sky, but I did not find an answer to my question about the points of stars. The astronomers of that period were engrossed in charting the positions and motions of the stars, but one gets the impression they had no interest whatever in the nature of those bright objects—what they look like up close, what they’re made of, why they shine. Of course I don’t really believe the ancients were so lacking curiosity. Surely Aristotle holds forth somewhere on the substance of the stars? But I haven’t found it yet. This entry was posted in linguistics. 12 Responses to How Did the Stars Get Their Points? I’m trying to think of how else to describe radiating light. Concentric circles? Once you have a light source with eminating rays, you’ll want to simplify your drawing. Four rays looks like a plus sign or t (already taken, perhaps? ), so five or six is about right. But why not 3? And that’s what puzzles me, because the stars really do appear to be dimensionless points of light. When I stare at the sky, I see some twinkling going on, but nowhere do I see pentagrams and hexagrams pinned to black velvet, or even the slightest hint of angularity. You must have very good eyesight. Consult an optometrist for reasons why a person might not perceive a dimensionless point as such. I agree with David, inthe past I also found stars to look like points of light, but sadly astigmatism developed over the years. The moon is usually represented as a luminous disk without rays going out from it. But the sun is often represented as a disk WITH rays going out from it. Nobody actually sees rays (or flames) going out from the sun. The rays in a drawing of the sun seem to represent that it is dazzling to the eye. I think this is a clue to the rays going out from the center in the drawing of a star. The star itself is a dimensionless point of light. Nobody sees literal rays when gazing at a star in the sky. The rays in the drawing suggest that the star is dazzling (if bright) or twinkling (if not so bright). We don’t think of the moon as needing the rays when it is drawn. It is not dazzling, in fact the light it gives varies a great deal with the lunar month. Twinkle, twinkle little dimensionless point of light? I always thought it was because of the image you get if you un-focus your eyes while looking at a source of light. The Chinese character for star - xing,? - also traditionally had a secondary meaning of dissemination, or spreading out. Sadly, my days of seeing dimensionless points in the sky are over. Astigmatism has caused them to appear as spiky blobs. Oh well. For the sun, it’s pretty easy to see how you might imagine rays coming out: anyone who has observed crepuscular rays or various kinds of atmospheric shadowing might naturally draw the sun with rays coming out. I don’t see it as too puzzling that stars would also be drawn that way (since they too emit light) but do find it interesting that the moon is not drawn that way. I looked at the sky last night. I didn’t see any “dimensionless points of light”. The less bright stars appeared as tiny dots, or tiny spheres — but with a nonzero thickness. The brighter stars appeared to acquire spikes now and then, especially before your eyes focused on them. (Looking from the ground to the sky — before your eyes have figured out they’re trying to focus on something far away — seems to accentuate the spikes.) What I saw were sometimes five-pointed stars, and sometimes five-pointed stars with one or two of the “points” missing. So yes, the effect may well be a mere accident due to a flaw in an optical instrument — only the most common and oldest optical instrument, of which there are more than 12 billion on earth. I’m actually surprised that you see dimensionless points of light at all. Even since my earliest childhood, I remember seeing a few “spikes”. Either my eyesight has always been bad, or when you say “I see some twinkling going on”, you’re talking of the same thing but just don’t think of them as spikes, because they’re not persistent and because of what you know from science.